Rough-leaved sage has small, round, medium green leaves and an upright growth habit. It can grow to 3-5' tall and 3-5' wide. Clusters of light indigo-blue and white flowers are produced from mid-summer through fall. 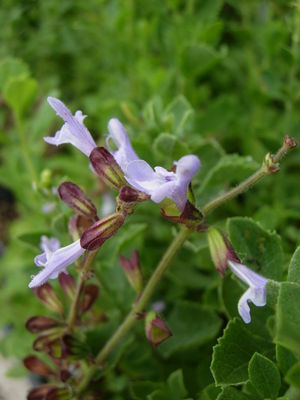 In its native habitat, rough-leaved sage is found growing in sandy soils in open fields and streambeds. In a garden location, it's tolerant of many soil types, including clay, as long as the soil's not waterlogged. Rough-leaved sage grows quite fast in its early years, reaching a height of about 3' and spread of 2' in roughly 3-4 years. After that, growth slows down. If you don't do any pruning, the plant can eventually reach 5-6' tall and 4-5' wide. Plants have an upright growth habit, although they occasionally throw out a wayward stem that sticks out sideways. These stems can be cut off at the base if and when they're produced. Rough-leaved sage is a good plant for providing summer blooming interest because it doesn't start to flower until late June after the peak spring flower season is starting to wane. It continues to flower through the summer into fall. Clusters of light violet-blue and white flowers crowd the tops of the stems. The leaves are roundish, medium-green and about 3/4" long. Like almost all sages, they're aromatic. 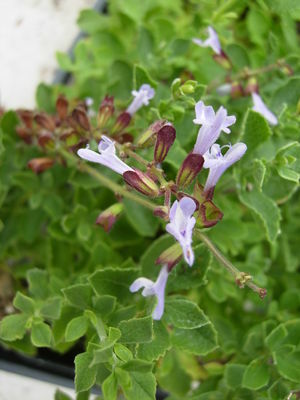 Plant rough-leaved sage in a spot that receives full sun or that's sunny for at least half a day. Keep the soil fairly moist in the summer for the first two years while the plant's establishing. In hotter inland areas, that means watering probably every 2-3 days in from mid-June to mid-October. On the coast, probably every 4-5 days will be enough depending on the weather and how foggy it is. Once the plant's established, deeper less frequent waterings once every 7-14 days should be enough. On the coast, you may be able to get away without watering the plants at all during the summer, although it'll probably look better with a deep watering every 2-3 weeks. Rough-leaved sage has survived 12 consecutive weeks of night-time temperatures between 22 and 25° here in the nursery. The foliage turned brown and crispy, but new shoots soon appeared in early spring. If you live in an area that's prone to regular frosts, you shouldn't do any major pruning until the danger of frost has passed as the old stems will protect any new shoots coming through at the base of the plant. This sage was first described in 1767 and its Latin name means "dwarf olive." It's only been in cultivation in California since 1991 when it was introduced by Western Hills Nursery in Occidental. Native to the western coastline of the Cape of Good Hope in South Africa. Occasionally, the plants produces an unruly stem that seems to want to grow sideways rather than upwards. These can be pruned off during the growing season if and when they're produced. Leave any major pruning till late winter after the risk of prolonged frosts has gone. Cut off any frost damaged stems near the base of the plant.